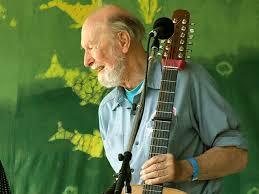 Singer-songwriter Peter Seeger was hounded by the FBI from the 1940s to the early 1970 because of his political views and his opposition to deporting Japanese Americans after World War II, according to bureau documents obtained by Mother Jones. The nearly 1,800-page file shows that the FBI began pursuing Seeger when he was an Army private and wrote a letter protesting a proposal to deport Japanese Americans following the end of World War II. The folk legend also joined the Communist Party in the 1940s, which later acknowledged. The FBI continued to try to tie him to the Communist movement. Posted: 12/18/15 at 9:38 AM under News Story.